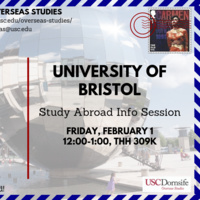 Learn more about studying abroad at the Univeristy of Bristol. Located in south-west England just 90 minutes from London, Bristol is a thriving urban center with an active arts scene and its own international airport. Bristol was named the best place to live in the UK by the Sunday Times in 2017 and is the largest city in the south-west. The city is known for its street art, theatre scene & creative industries as well its focus on sustainability, walkability, green spaces and its history as a vibrant port city.